The game pretty much just consists of the screen above. You buy stuff and watch your money come in so you can buy more stuff. There’s not a lot to it but the speed of progress in the game is just right that I just keep coming back and checking it. Watching your money count continuously shooting upwards is somehow hypnotising. I call voodoo mind control/ magic/ whatever. The best part about this game is that, once you have acquired managers (my favourites being W.W. Heisenbird looking after the car washes and Admiral Snackbar for your shrimp boats) for your businesses, they continue to earn money while you’re offline. Waking up to a message that you’ve become a trillionaire in your sleep is great. Even with this ability though, it doesn’t take long before you realise that you’re just not getting rich fast enough. This is when you can choose to sell up everything you’ve worked so hard for to receive Angel Investors and extra upgrades. I’m not entirely sure why or how angels come into business but it really does speed up your income. I’ve been playing it for a while now and I’m only a quintillionaire. 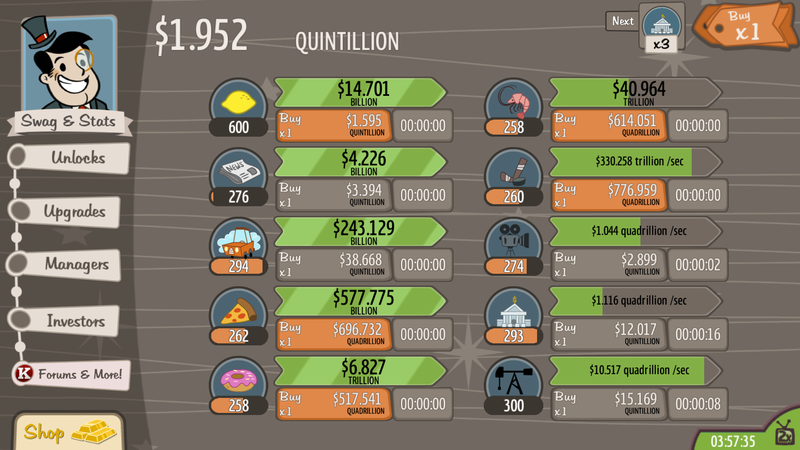 It’s a long long road until I become a quinsexagintillionaire. Yes, apparently this is a thing and means 10^198! Now if you’ll excuse me, I’ll be off so I can start applying this amazing business model in real life. This entry was posted in Games and tagged Adventure, Capitalist, Entrepreneur, Gaming, Lemonade. Bookmark the permalink.